Americans have numerous sources of news — from radio to television and websites — to keep up with the latest coverage of politics and government. But what about political satire? Pew Research Center’s recent report on Americans’ media habits finds that a portion of online adults get their news from two Comedy Central staples, The Daily Show and The Colbert Report. And other studies have shown that people do, in fact, learn from these programs while they laugh. As The Colbert Report ends this month after 10 seasons, here are some key facts and new analysis about the show’s audience, including who has heard of, gets news from and trusts it as a source of political news. 1About six-in-ten (62%) online adults have heard of The Colbert Report, and 10% get news there. More people have heard of the Comedy Central show than many other news sources, including NPR (53%), The Economist (34%) and BuzzFeed (31%). But The Colbert Report is not as well-known as top cable news channels, broadcast television networks and major national newspapers. Although its audience is not as large as major TV networks, the show attracts a following similar to some national newspapers: One-in-ten (10%) online adults said they got news from the show in the previous week, on par with such sources as the Wall Street Journal and USA Today. 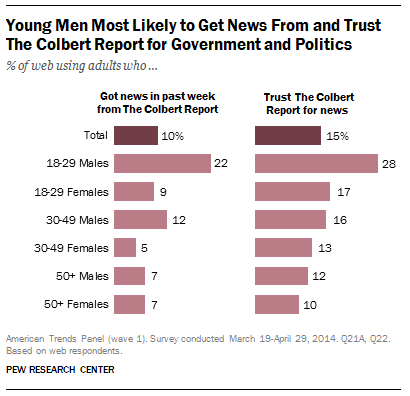 2 Younger males are the most likely to use and trust The Colbert Report as a source of news about government and politics. In our recent survey of online adults, nearly a quarter (22%) of 18- to 29- year-old males say they got news about politics and government from The Colbert Report in the previous week. That is more than twice that of 18- to 29- year-old women and significantly higher than any other age group. Also, these younger males are more likely to trust The Colbert Report as a source of political news; almost three-in-ten say that they trust it, more than any other age group. 3 Colbert viewers turn to a variety of other sources for political news, but none more so than its Comedy Central counterpart, The Daily Show. Roughly three-quarters (76%) of web users who get political news from The Colbert Report also get news from The Daily Show, another satirical show whose audience also skews liberal, younger and male. Many Colbert Report viewers also get their news from CNN, local TV news and NPR. 4Those with consistently liberal political views are the most likely to use and trust The Colbert Report. Roughly a quarter (26%) of consistent liberals reported getting news about government and politics from The Colbert Report in the previous week. That is far more than other ideological groups. In fact, a mere 1% of consistent conservatives say they get news from the show. The share of consistent liberals who get news from The Colbert Report is similar to that of The Huffington Post (29%) and CBS News (30%), but somewhat lower than its lead-in The Daily Show (34%), as well as a number of more traditional sources including NPR (53%) and CNN (52%). Trust follows the same pattern. About a third (36%) of consistent liberals trust The Colbert Report, more than any other ideological group.